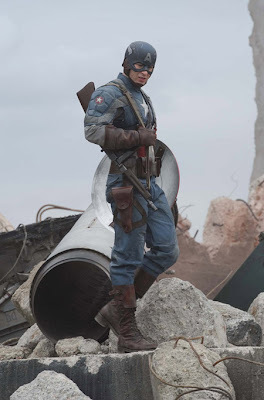 Reel Talk Online: Trailer Debut: "Captain America: The First Avenger"
Trailer Debut: "Captain America: The First Avenger"
Several months ago we shared the first images of the hugely anticipated Captain America movie starring Chris Pine in the lead role. Today, the trailer invaded cyberspace (and, yes, it's kinda badass). In typical superhero movie format, audiences will see the origins of Captain America and how he became the phenomenon he did. But this medieval takes a medieval adventure approach, and couples up with awesome graphics and action sequences (or at least it does in the trailer). Take a look at the full clip below. Captain America explodes into theaters July 22.
if my theory of bad trailer = good movie holds up, this could be the greatest film ever made. terribly irresponsible advert for steroids. Looking forward to this movie. Trailer shows amazing effects on making Chris Evans look scrawny and feeble before his transformation into Captain America. I still can't decide how I feel about this one...I think it's either going to be really, really good or really, really bad. But not "ok". I watched this movie in the first week of august. and i say that it is not what i expected in the trailer. i don't know if there are cuts in the film because i was confused with it.